After months of not bothering to do anything with my nails, I finally decided to give myself a holiday manicure the other day. Needless to say, I'm loving, loving, loving this combination. I think it would be so perfect for Valentine's Day, too! Fishnet Stocking is *the* perfect red and Minnie Style is such a great glitter - the white flecks really make it stand out. I'm thinking about adding some OPI Fresh Frog of Belair (green glitter) for next week, but that might be a little too excessive...but I also just might not care. I really like those! I just did a similar thing last week but used white with glitter polish on top. Christmas/New Years is the perfect time to try fun manicures like this! Your nails are SO perfect! And I want that glitter! I love the square pieces! awww good luck finding a home for Chi Chi! LOVE your nails. And Chi Chi is so gorgeous! Hope she finds her forever home soon. Such a pretty shade, definitely perfect for the holidays! I hope Chi Chi finds a loving home for Christmas! Your nails are fab! And so much fun -- looking forward to following along! 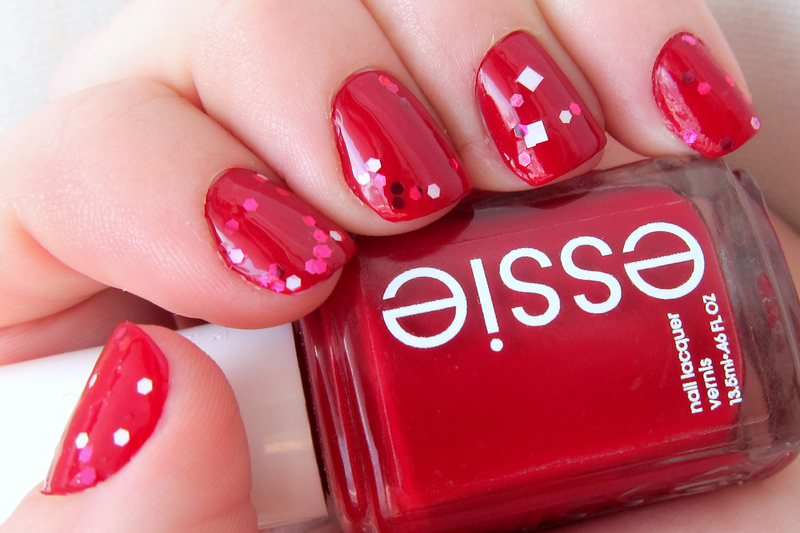 Those are such great holiday nails, I love that glitter! Also, kudos to being a foster parent I would never be able to give them up even to a good home. What an awesome color combo! Your nails look so fun and festive!! I love the holiday sparkles! So cute for the holidays! Your nails turned out so cute! !